Where to Buy Philips Hue Lights for Cheap - Refurbished or Used? Philips Hue is becoming more and more popular, more retailers stock a whole range of Hue Bulbs and therefore more offers and discounts can be found. Many will know that the Hue system is an expensive gadget to add to your home, once you have a few bulbs you quickly want to change all your bulbs over to Hue bulbs. A starter kit is the best way to get the best value when installing your first Hue bulbs, you require a hue bridge to get going and the starter kit comes with this. As you can see there is a range of different starter kits available depending on the bulbs you need. Refurbished items are a great way to save money, they are cheaper than buying brand new, and offer more protection than buying used. Refurbished Hue bulbs are used or returned products, the key thing is that they are tested before being resold, and as they are not brand new are old at a discounted rate and marked as refurbished. You can pick up refurbished Hue Bulbs, Light strips, starter kits and switches. You really can make a good saving compared to buying brand new, and remember these have all been tested before reselling. Refurbished Hue bulbs can be bought from Amazon and eBay. Money can certainly be saved by buying used Hue bulbs and switches, auction sites are a great place to find users selling their bulbs. If you are looking at buying used bulbs then you also want to make sure they are the latest versions, older generations of the bulbs are dimmer and not as good when it comes to certain colors, so you must be aware. When it comes to smart bulbs Hue isn’t the cheapest, there are a range of alternative smart bulbs you can buy and also a range of compatible bulbs for hue that are also cheaper. Different retailers may have offers on Hue products, special sales on Hue bulbs, discounts or packages. Amazon from time to time have offered special packages that combine bulb and light strips for example at a slightly reduced rate then buying individually. Discounts can usually be found on sale days such as Black Friday, Amazon prime Day, Cyber Monday or January and winter sales for example. At the moment you can purchase bulbs in up to packs of 4 depending on the bulbs you require, these work out at better value. Offers pop up from time to time from different retailers where they may have a 3 for the price of 2 on bulbs, or a discount sale. Black Friday usually brings up discounts on the Hue range. If you require more bulbs then an independent retailer that stocks Hue maybe the best place to go, they may be able to offer you a reduced price on your overall purchase unlike large high street stores which may not do this. 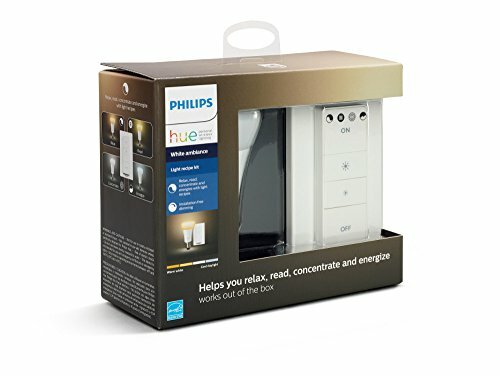 Philips have also started offering different packs and options for purchasing Hue, for example you can buy a Hue dimmer and bulb pack which would work out cheaper than buying them separately. So if you are looking at getting a Hue dimmer switch, then spend a little more and get a bulb with it too which you can use within your home. Take some time to decide what bulbs you need and also other items such as switches or light strips. Amazon has had some great offers and discounts on and also some great offers on Alexa and Hue where if you bought an Amazon Echo it also comes with a Hue bulb too. So think about what you need and look at the best way to get this through different packs and offers. Philips have recently announced some new changes and options for their Hue smart lighting range. This increasingly popular home smart lighting system is now a little cheaper to incorporate into your home with the new starter kits which have been released offering better value for money. The previous starter kits used to come with 3 bulbs and a bridge and were ever so slightly cheaper, however now you can get the White and Color Ambiance kit which includes 4 bulbs and a hub for just $199, the best value set up they have offered which includes 4 coloured bulbs. Even cheaper is the white starter kit, this comes with 4 A19 white bulbs and a bridge all for just $99. Along with changes to the starter packs, Philips have also announced a new Cher suspension fixture featuring a White Ambiance light, retailing at $229. A beautifully designed wide orb light it would look great hanging over a dining table or kitchen breakfast bar. Philips also said that the Hue candle lights announced earlier in the year will start shipping in October. Check out the Hue Starter kits below. Keep an eye on stores, in the UK Argos, Curry and John Lewis have offers from time to time, and in the US Walmart and other electrical stores too.